Warning: this blog has nothing at all to do with writing, music, creativity or fun stuff like rabbits or chickens. It’s a lot more serious but still part of NaBloPoMo. After yesterday’s joyful Spring interlude, this morning has reverted back to bleak, colder weather again. For those of you outside of Australia, there’s a saying in Tasmania, “if you don’t like the weather, come back in ten minutes!” But I’m getting the feeling that the weather is scared to switch over from Winter to Spring. Yes, I know how silly that sounds but it’s playing havoc with my body and my brain. Everything is screaming to me that the seasons are shifting but down here in Tasmania it hasn’t happened yet. Yes, the days are longer, the soil temperature is warmer, winter vegetables are going to seed, the fruit trees have flowered and I’ve packed away the thermals for this year……. but still, the colder, wet weather keeps coming back. Now, maybe I shouldn’t complain about this too loudly. Last month saw some of the worst bushfires in NSW in a generation – and yet, we had snow on Mt Wellington and my water tanks overflowed. 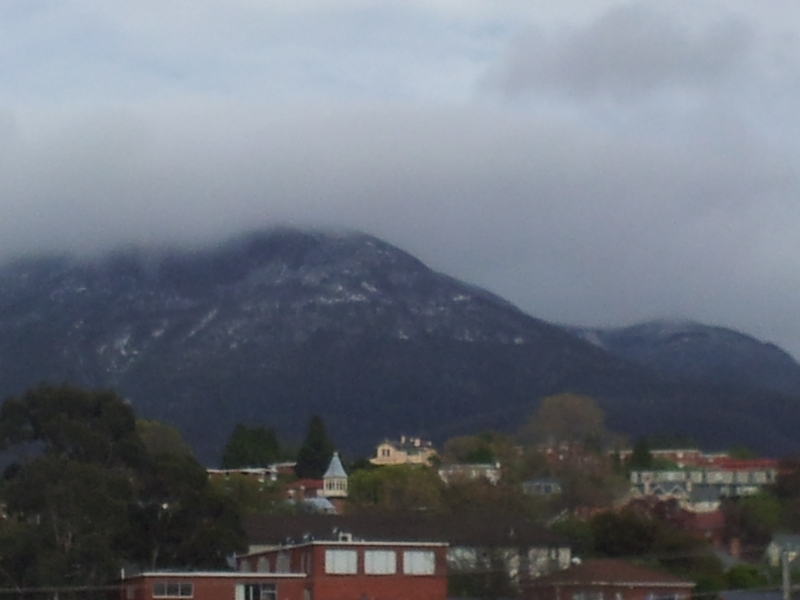 For those of you unfamiliar with my hometown, Mt Wellington (aka “The Mountain”) is the barometer of the whole city. Having grown up in and gone back to the country as an adult, where my livelihood was dependent upon the weather, I still find myself looking out to the mountain each morning to get my bearings. I think that recent newspaper reports in Australia have got me worried too. This week, former conservative Prime Minister, John Howard, stepped into the climate debate, delivering a speech in the UK, suggesting claims of climate change are exaggerated. This bothers me tremendously. In my lifetime, I’ve observed that our weather patterns are becoming more unpredictable. We have more “records” in rainfall, dry days, wind speed, high and low temperatures in particular months. But in the greater scheme of things, my lifetime is only short-term. Nevertheless, my personal belief is that climate is always changing, but human activity has accelerated this change to unprecedented levels. And we have precious little time left to act. Looking over longer-term records, Hobart’s cool temperate climate appears to be less stable and predictable than it once was but locally, few are prepared to address the issue front on. The local Bureau of Meteorology offer the data but little analysis, which is understandable. They do however, offer some excellent Climate Education Links and Tasmania has a Climate Change Action Council. Their “Blueprint For Action” acknowledges human activity as a prime cause of rise in greenhouse gas emissions, but unfortunately, this body is one of the things likely to be cut after the upcoming state election, next year. Currently, Tasmania has a Labor/Green government, which has its issues but at least acknowledges the need for government to lead on climate change. However, like the rest of the nation, we are swinging back to a more conservative viewpoint, and it’s likely we’ll see a Liberal (that’s right-wing conservative to you non-Australians) government elected in the first half of 2014. Yes, the government will change again – but the problem of addressing our changing climate will still be there, still demanding our attention. I look to the mountain and can’t get my bearings anymore, and I look to my son, just starting his journey as an adult, and I worry about what he’s inheriting….. Previous Do Rabbits Dream of Long-Eared Sheep? Next And Now – Back to the Music!